iwas wondering if these were okay to use. That is not a backwards McMahon Snap, it is the same thing as all the McMahon snaps. it's just the swivel needs to be pulled to the top small end. what happened was i acidentally got the #6 mcmahon snap.Only the snap.Then I bought a 4/0 swivel then connected it together and the swivel is kinda big so its kinda hard to get it to go at the small end. 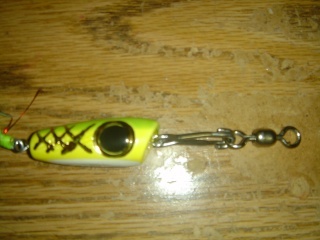 Yea, The swivel does look way to big, the snap also...You could use it, but the swivel and large snap is adding a lot of weight to that smal lure, plus it is way to visible to the fishes eye. 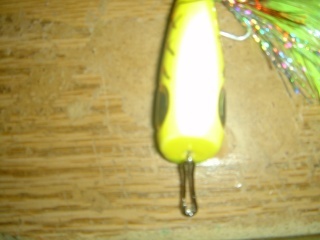 Better to tie the line to the lure and put the swivel on a 4 to 5 foot leader then to main line. At least it will still swivel but all that hardware won't be at the lure...The 4/0 swivel is for some big rigs like Ulua poles. Check out Marks posts about McMahon snaps and sizes used on this Tech page. I was wondering if i could just use the mcmahon snap #4 and tie the line straight to the snap. 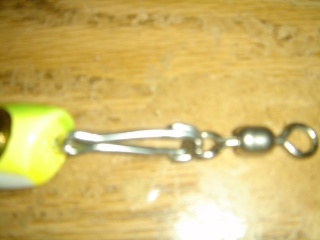 That looks like a smaller size then your first picture, but the swivel shold be pulled to the small end of the snap and the scissors end of the snap can be put on the eye of the lure and taken off easy to change lures...You do want to have a swivel somewhere to keep the line from twisting to much when reeling in. 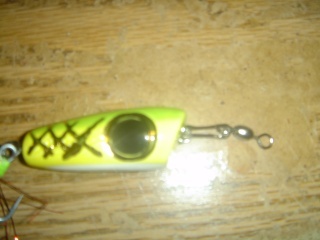 Like Mark reccomends I also use #2 for the 1/2 oz and 1 oz lure and # 3 or # 4 for the 1.5 or 3 oz lure. But those would be okay, they are more size matched then the big # 6 snaps. Mahalos David for bringing this to our attention. Here's the deal, you get what you pay for. The regular swivels are not very effective in eliminating line twist. The Macmahon ball bearing swivels are far superior to the less expensive crane type swivels. They are pricey, but worth it in my opinion. Another alternative would be to use a ball bearing swivel or a Spro swivel above the leader like MauiGuy suggested. 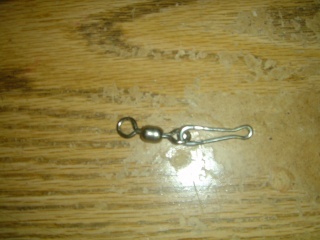 Spro makes a superior swivel that is minuscule and super strong, I use those also on my 1/4 oz rig. Hey thanks mark for that info but you know in the picture where i used the #4 mcmahon snaps, can i use it like that? Oh and mark, do you know where i can get the mcmahon snap swivels with the ball bearing swivel on oahu? Any configuration can work. You will have to piece'm together. Smaller the better. Call the stores 1st to check if get. Save your parents gas and time. I'm thinking of selling them on my web site. That way you won't have to buy 12 at a time from Cabels. That is a very good idea Mark. So when we order lures from you online, we can also get McMahon snap swivels. Or course you are going to use bearing swivels ? Thanks guys for all the good info with the McMahon Snap Swivels. I was able to put together some . @ $6.49 at Sport Auth. The look just like the ones from cabela's. Hope this helps. Thats a good idea mark to sell the snap swivels on your website. which sports authority you went to? I bought them at Waikele and Kapolei. 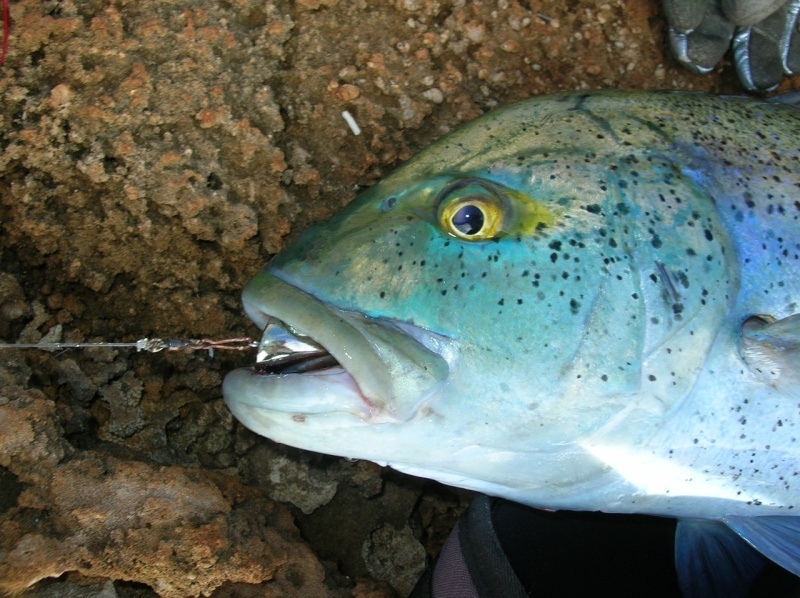 Down here in our waters we do try to avoid to put a swivel on the leader, far away from the lure itself. Because on fast retrieve, they tend to create a bubble trail, and Macs are known to go for it. If they bite away from your lure, on the swivel, they just cut the line. But maybe you guys have less problem with Spanish Mac, I think that you call them King Mac or something like that, not really sure.